Bruce Campbell at a USO tour event near Baghdad, Iraq. Photo by Mass Communication Specialist 2nd Class Edwin L. Wriston. This page covers the author of If Chins Could Kill: Confessions of a B Movie Actor. For other authors named Bruce Campbell, see the disambiguation page. You will only gain admittance with valid ticket / receipt and / or ID. If you do not have a ticket, please don't come. We are very sorry about this but Bruce will sign some extra stock during the event and that will be available for those unable to attend the from the next day. We know you will all want your moment with our hero so, to enable everyone to get that moment, we need to have some protocols in place to keep the signing queue flowing. Please note you will not gain access to the space in which we are holding the event until 'doors open' at 6.30pm. If you require special assistance please contact the shop in advance so we can make arrangements for you. The book will be available for you to purchase as you arrive. Bruce will be signing the copy of the book and doing dedications, i.e. name only, no 'quotes' at the end of the event. You will be asked to stay seated until you are asked to come and join the queue. This way we can keep the queue flowing and those not in it yet are still comfy in the chairs. Everyone will get through the queue, so don't worry, if you are not first you will still get your moment. Either as you buy your book or while you are sitting waiting to join the queue a member of staff will come and ask for your name so that there is a post-it note ready, in the right place in your book with the right name and the right spelling of that name for your dedication... So start thinking about who your are buying the book for, yourself or someone else and if it's the latter, make sure you know how to spell their name! He will only be able to sign one item of relevant merchandise (i.e. something from his body of work) if you are buying and getting a copy of the his book signed. So please do not bring anything more than that one special item. The merchandise will be signed there will be no dedication. 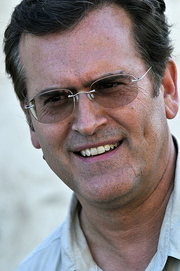 "Bruce Campbell" is composed of at least 14 distinct authors, divided by their works. You can edit the division. Bruce Campbell is composed of 7 names. You can examine and separate out names.